Mr. 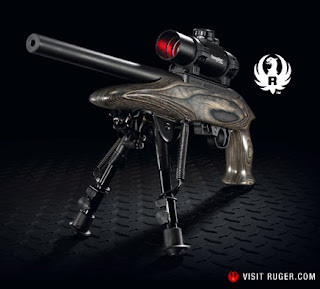 Completely: Ruger Charger - Best Kept Secret! I got a call from Damiphino in Billings wanting to know if I'd picked up a Charger yet. The first thought that came to mind was a 60's Dodge muscle car, but that was clearly not what he was talking about. In December Ruger released their new target pistol, the Ruger Charger. Basically it's a Ruger 10/22 receiver with a 10" barrel on a very cool silhouette style stock. Better yet, the price is somewhere around $375. Hmmmmmmmmmmmmmmmm, wonder what it would take to get it up to 'competition' level accuracy. I do know my M/R Picuda wasn't bad outta the box, but the trigger pull was a horrendous 5-6lbs. Replaced it with a 1.5lb Jard system & it's like nite & day. since we don't need no stinkin' bipod, couldn't we just buy a used 10/22 and make a pistol grip stock for $200 including getting a pro to do the barrel cut? Just read the comment about cutting down a stock 10/22 rifle. NOT a good idea. The problem is that the receiver was registered as a rifle and therefore has to have a 16 inch barrel or it has to be registered with ATF as a "short" rifle. There is a bunch or paperwork for both the rifle and the owner. Also, if I recall correctly the overall length has to stay at 26 inches. "SHORT-BARRELED RIFLE - A rifle having one or more barrels less than sixteen inches in length and any weapon made from a rifle if such weapon, as modified, has an overall length of less than twenty-six inches. 18 USC"
If you want to modify a rifle to have a barrel under 16" in length, or an overall length under 26", you first have to file a Form 1 and pay a $200 tax. On top of that, some states have state laws forbidding this, regardless of federal law. Washington state is one of these ... SBRs and SBSs are completely unlawful in WA for individuals. Great post. I am anxious to get one of these in my hands. I am sure that as we have come to expect from the 10/22 this will be a great platform. Give it a few months and the accessories will start rolling out in production to make this an incredibly fun gun. Of course you can buy a 10/22 receiver from Brownells, and build your own "Charger" from the ground up. This is legal because the receiver has never been registered as a rifle never having had a barrel in it. I would enter in in the books as a pistol or have your dealer do pistol paperwork on it when you pick it up. This would allow you to use your target trigger group on either your rifle or pistol with the change over taking just a few minutes. I just picked mine up and all I can say is I love it.. I just picked up a charger and I love it. I payed $325 for mine. I put a BSA BZ30 red dot sight on it. ( about $70 ) Its ok. I only have one arm so the bi-pod was a very welcome feature. It was my first time with a red dot sight, but i still kept 6in 40 round groups at 25 yards. (with cheap ammo) Over all I loved it but I will upgrade the scope in the near future. No News - Is That GOOD News?